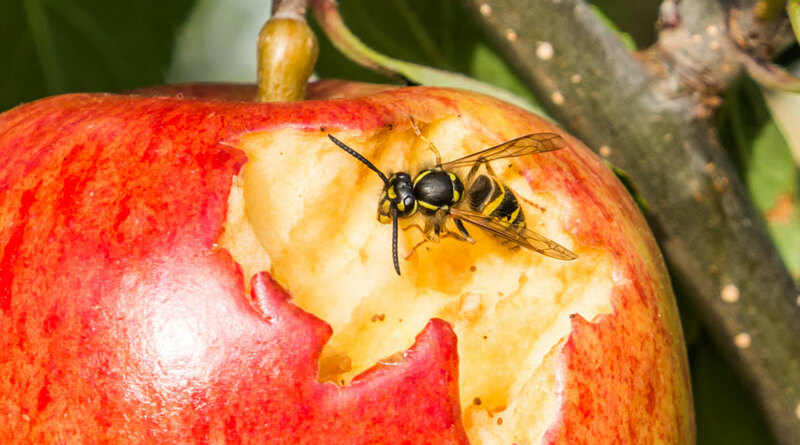 (Various Dolichovespula, Vespa and Vespula species) Wasps rarely do any direct damage to plants, but they can damage ripening fruit. But they have an annoying habit of flying around you, especially when you’re eating. Wasps are reasonably large flying insects whose bodies are recognisably divided into three sections – head, thorax, abdomen. They are closely related to ants and bees. They have black and yellow striped bodies. Adult worker wasps are about 1.3-1.5cm (½in) long and queen wasps are 2-2.5cm (¾-1in) long. Queen wasps emerge from hibernation in spring. At first, she works on her own to build a nest – about the size of a golf or tennis ball – where she lays eggs and gathers food for her first batch of larvae. The white, maggot-like larvae pupate and then emerge as infertile females, known as workers. These workers take over the task of building a larger nest and gathering food. The queen now remains in the nest and lays lots more eggs. By late summer, males and fertile females are produced, the females becoming the following year’s queens. In autumn, the workers, males and queen die and the young queens leave the nest to find somewhere sheltered to overwinter. There are also several species of solitary wasp. These fascinating insects either have no sting or are very unlikely to sting. Wasps cause huge concern for many people when they fly around or at them. This is especially true for those who have severe allergic reactions to wasp stings, symptoms of which can be life threatening. In the garden, they are mostly a nuisance to people, rather than a destructive pest. They do little direct damage to plants, although in summer they will feed on ripe fruit. On soft-skinned fruit, such as grapes and plums, they can create feeding damage on their own. On tougher skinned fruit, such as apples, they enlarge damage and cavities created initially by other factors, such as birds pecking the fruit. Worker wasps will gnaw at fences, sheds and wooden garden furniture to gather fibres used to make their nests. This gnawing usually only scrapes away the surface wood and rarely does any real damage. Wasps are mainly predatory insects, eating other insects or carrion. In early summer, they will feed on caterpillars and even aphids, making them useful for reducing pest problems. Wasp nests can be a problem if they are disturbed. 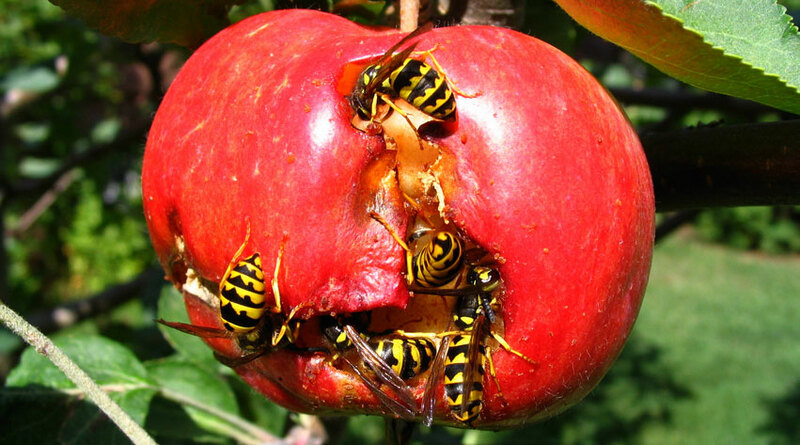 Wasps will defend their nests with vigour and disturbed, angry wasps will sting anyone nearby. Nests are often built at the base of trees or in the soil, but also in undisturbed compost heaps and even rough grass. You can usually recognise the presence of a wasp nest by a regular and steady stream of wasps flying to and from the nest entrance. Individual wasps are usually swatted or killed in another way. If you find a wasp nest, and it’s possible, it is best left alone. They are abandoned and die out in autumn and are never re-used. The Waspinator is a wasp nest decoy. Hanging one in the garden deceives wasps that other wasps live there and they will go elsewhere. You can protect ripening fruit by hanging jam jars half-filled with water with some added jam or sugar. Pierce a hole in the jam jar lid, or cover the jar with a sheet of paper with a hole punched in the middle, held in place with an elastic band. The wasps will be attracted to the sweet-smelling, fermenting liquid, enter the jam jar, can’t get out again and drown. There are numerous sprays, powders and baits available to control individual wasps. Similarly, there are various products available for killing wasp nests. These should be applied in the cool of the evening when wasps are less active and fewer are flying. As there’s always the risk of being stung when treating nests, contact a local pest control contractors to do it for you. You can’t prevent wasps from coming into your garden and building their nests – wherever they want to build them.